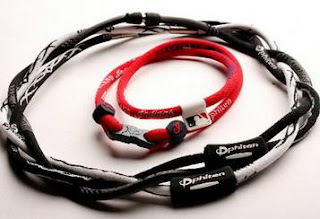 Phiten Co., which has an office in Cleveland, and others who make them claim their necklaces -- and titanium-laced bracelets, tape, socks, sleeves, lotions, gels and, coming soon to a store near you, bed sheets -- may help promote relaxation, reduce stress and relieve pain. They're also supposed to boost energy and help players recover faster by harnessing the body's natural bioelectical currents. Sounds like HGH to me but I'm no scientist. *checks degree from CrapOnlineU.com* Nope, I'm not a scientist but I can marry gay couples. Baseball players are superstitious and don't mind riding other players new found voodoo. Isn't that right Shin-Soo Choo? "I saw Beckett and Justin Morneau use them so I started to use them," said Indians right-fielder Shin-Soo Choo. "Cliff Lee and CC Sabathia wear them." Choo wears three braided Phiten necklaces, called a "tornado." He's worn a titanium necklace for three years, adding a strand each season. And, yes, he's noticed a difference. Sort of. "Not like I feel totally different," he said, "but I feel good." "It's just more of a fad with the kids," said Nate Cannell, manager of Cardboard Heroes at Beachwood Place. "We sell more to kids than anyone." Phiten's Gary Rodrick and his son, Austin, who operate from the Cleveland office, make the rounds in major league clubhouses during the season and spring training, handing out necklaces to the players to try out. They target pitchers for maximum marketing exposure: They're on the television screen longer. Am I getting lazier? I think I might have blockquoted this entire post. I'll make it up to you guys though. I ordered a necklace which should help with my writing and a belt which should help with the ladies. Grrrr.